Creating a solid list of keyword phrases that describe what you are, what you do, and why you do it will help you create content, name pages and give structure to search engine friendly URLs. Here are some tips for starting your design the right way. Your business plan is important – don’t skimp on this step. If you have an established business, you’ve already done this. If you’re just starting out, don’t worry about the website until you have a plan for the business. Once you have your plan, start thinking about how you’d find a business similar to what you’ll offer. How would YOU shop for your product or service? Those are your root keywords, write those down. Are you a business that serves a local, state-wide, country-wide or international radius? Those considerations must be included in your keyword plan. Write down the major areas you’ll serve along with regional colloquialisms that your target market might use to describe the area. Now you have words that describe your product & service, and words that describe your service area. 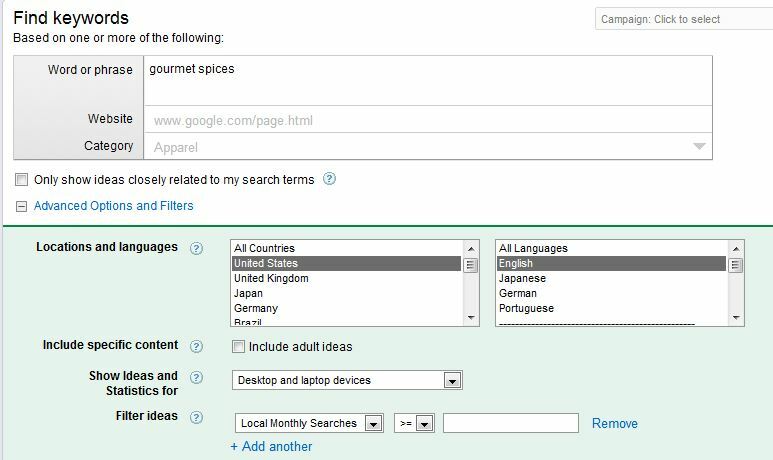 Plug different combinations of those into your Google Keyword tool. In the example below, I looked for words that might help me sell gourmet cooking and project spices through an online e-commerce site. I only want to sell in the United States due to customs restrictions – so I limited my information to United States, English-only for the time being. I did not narrow the category at all, although there is a food and online grocery shopping category. I find using these setting narrows the keyword results I receive. Now we can see the keywords that bring traffic. This tool is actually for AdWords, so it’s a tad vague. Google wants you to dumb a bunch of money into a campaign with not a lot of information. The information we do receive will suit our purposes though. 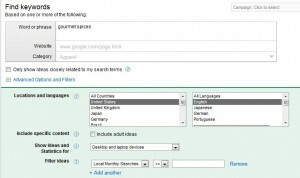 Take a look at the “competition” column and the “Local Monthly Searches” column. Highly competitive keywords will be harder to rank for. We recommend using a combination of easier, lower competition keywords (low hanging fruit or long-tail terms) and higher competition keywords. The high competition keywords should be saved for the pages that contain the text and incoming links to support their rankings. Burying high-competition terms 4 layers deep in a site with limited internal and external link support will mean they’ll need much longer to rank than if they were on a higher trafficked and linked-to page. This entry was posted in Analytics, keyword research, SEO by Carrie Hill. Bookmark the permalink.